Please find below a few sample menus from the hotel, contact us directly if you wish to have a copy of our most recent menu as they may vary throughout the year. Should you have special dietary requirements please advise us and we will pleased to accommodate you. You may like to make your evening meal even more pleasurable by booking a hotel room for the night! Click here to view / download our Breakfast menu. Click here to view / download our Riverside Restaurant menu. Please note! For any parties of 10 or more, we are doing a special menu. Please include any dietary requirements when making your reservation. View / download our New Summer Menu for Dolly Blue Bar & Grill. Here are the recipes of one main dish and two of our desserts which you may like to prepare at home. Mix all of the dry ingredients together in a bowl. Heat enough vegetable oil in pan/wok or deep fat fryer to deep fry the beef. Mix all of the sauce ingredients together and reserve. Fry the vegetables in a little vegetable oil for 1-2 minutes. Dredge the beef in the cornflour mix, shake off excess flour and deep fry until crispy, drain and keep warm. Add the sauce mixture and noodles to the vegetables and heat through. 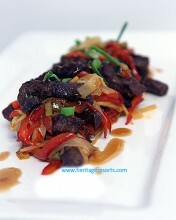 Fold in the beef and serve with fresh lime wedges. Bring the cream to a boil and reduce by a third, leave to chill. Take one tablespoon of the sugar and mix with the egg yolks, add the cream and stir well. Return to the pan and cook gently, stir constantly and do not allow it to boil. Once the mixture coats the back of the spoon remove from the heat. Divide between four ramekins and refrigerate once cool. Use the remaining sugar to cover the surface in an even layer. Caramelise the top with a blow torch or under a very hot gill. Add the sugar to the cream and bring slowly to the boil, simmer for three minutes, remove from the heat and stir in the lemon juice. Pour into six suitable glasses or bowls, allow to cool before refrigerating for at least four hours. Combine water, glucose, sugar and lemon and boil. Remove from the heat and leave to cool. Stir in the fruit puree and pass the mixture through a fine sieve. Place in an ice cream/sorbet machine and churn according to the manufacturer’s instructions. To serve, remove the posset from the fridge, top with a ball of the sorbet, serve with shortbread or Italian biscotti.